Motivation is a person's level of inner drive and energy that they're willing to expend on a given activity to meet an unmet need. 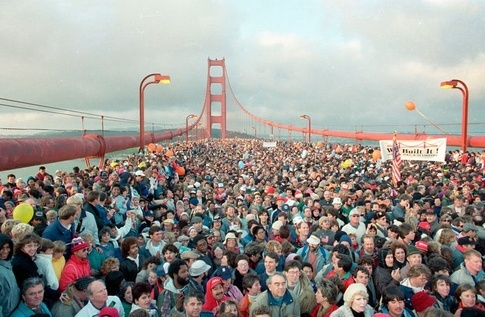 I recently read a post on Quora about May 24, 1987 when the arc of the Golden Gate Bridge was flattened by the load of a large number of people – some reports stated that as many as 300K people were present at the event. The bridge was opened to this huge throng of people as part of its golden anniversary. This was the first time I had heard of this event. The Quora post contained a couple of factoids that I thought I would confirm here. I will use the same assumptions as used in a newspaper article on the subject from the San Jose Mercury News. densely packed people are a bigger load than densely packed cars. The load on the bridge was 2.9 tons per foot. I mainly am interested in bridge event because it discusses the loading of a packed group of people. I occasionally here about structures collapsing under the loading of people (e.g. floor, balcony), and I was curious about the difference in loading between a packed group of people versus the loading normally assumed in structural calculations. Here is the quote that had the information that I was interested in. I thank Ian McClatchie for providing the following numbers. He estimates that the loading on the bridge from the crowd of people that day was approximately 5813 pounds per linear foot, equal to 2.9 tons per foot, nearly 50% higher than the original design load of 2 tons per foot. But because dead weight had been removed in the previous year, the new design load was upped to 3.37 tons per foot, and the value that day of 2.9 was 14% below this value. I gleaned some assumptions from an article in the San Jose Mercury News, which I quote below. No one knows the exact weight of the pedestrians on the bridge on that May day. But assuming the average person weighs about 150 pounds and occupies about 2.5 square feet in a crowd, there would have been about 5,400 pounds for every foot in length. That's more than double the weight of cars in bumper-to-bumper traffic. 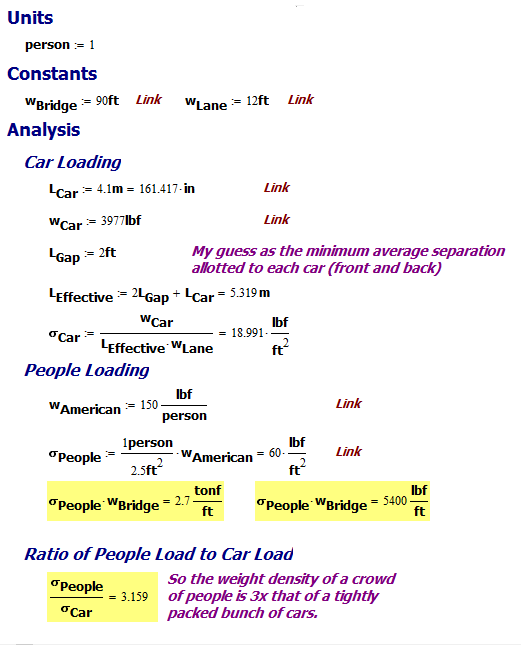 Figure 2 shows my rough analysis of the loading presented by both cars and people. I duplicated the results from the Mercury News article. My numbers are rough but probably not too far from reality. However, I did use the newspaper's assumption for the average weight of a person and not the value measured by the government. Of course, the bridge crowd likely included children, which would lower the average weight. Figure 2: My Analysis of the Bridge Loading. The bridge loading for cars is about 1/3 the loading for packed people. My value of 2.7 tons per linear feet of bridge is close to the 2.9 tons per linear feet of bridge stated in the Quora post. Just a quick check on where some numbers from a Quora post. I also was able to determine the loading imposed by a mosh pit-type group of people. I calculated a load of 60 lb per ft2 for a packed crowd, which seems like a lot.